Special Court of Honor Night! Our fall Court of Honor this past year was indeed a special event with a huge turnout! The combination of an annual family pot luck dinner and several invited guests for the Wood Badge beading ceremony of Scoutmaster Tom McCandless resulted in the need for a new larger, locale for this venue: our local Cottle Elementary School. This Court of Honor witnessed the impressive recognition of 14 rank advances, a stunning 88 merit badges, and one special BSA award, the 1-mile Swim! This dramatic uptick in advancement completion reflected an equally impressive 50% increase in summer camp attendees! There were a record number of proud parental smiles in the audience. The other main highlight of the evening was the announcement of the troop’s inaugural Scout of the Year award. According to the senior committee members that determined this year’s winner, the once-in-a-lifetime winner, ASPL Brad M., was honored for his high level of participation in all troop activities (including campouts), above-normal advancement (including completion of several Eagle-required merit badges), consistent leadership role and positive Scout spirit! Several adults were involved in the process and the committee had several outstanding candidates. 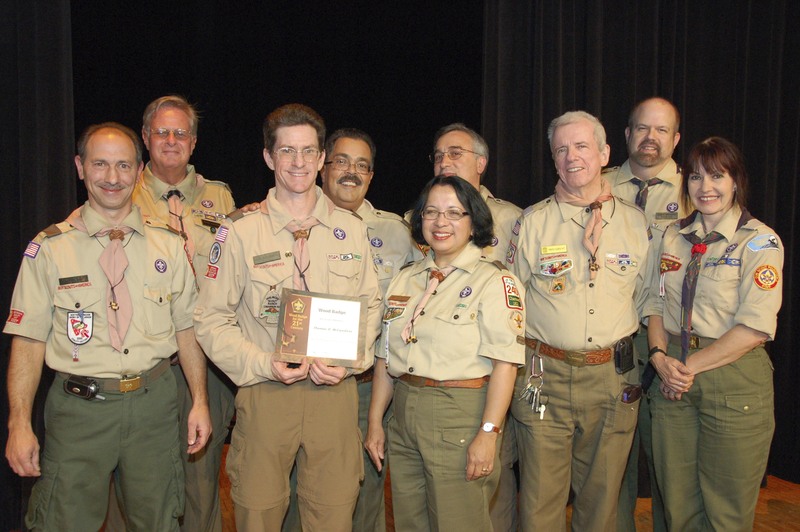 The Scout of the Year committee expects another outstanding group of high-performing scouts during the 2009 scouting year. This “best practices” recognition award was “borrowed” from Troop 240 Riverdale and will be a great new tradition for our troop! On the walls of the Tuckahoe Community Center will be a second plaque, to match the Eagle Scout plaque, honoring all future Scout of the Year recipients. Congratulations Brad! Finally, after two years of hard work, Scoutmaster Tom completed the most advanced level of training available to adult Boy Scout Leaders, the completion of the Wood Badge (WB) course. Members of the Scoutmaster’s WB course & Bear Patrol were present to participate in the symbolic “beading” ceremony, which was led by mentor and Scoutmaster Joe Acquafredda of Riverdale T-240 of the Greater NY Council. 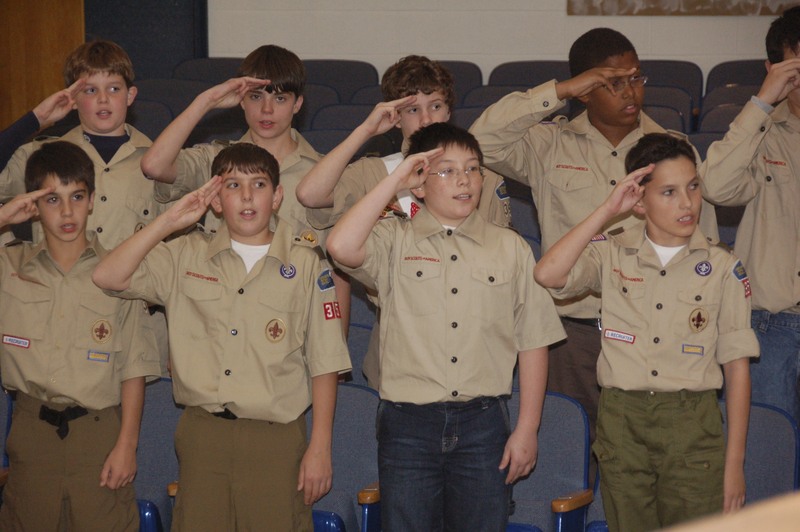 Troop 240 is believed to have the largest number of Wood Badgers in the area, with about a dozen and several regarded as “3 Beaders” (WB course instructors). Mr. McCandless is only the third recipient of the Wood Badge award in Troop 353’s history, following in the footsteps of sr. Committee member Richard Schraudner and founding Scoutmaster John Callahan. 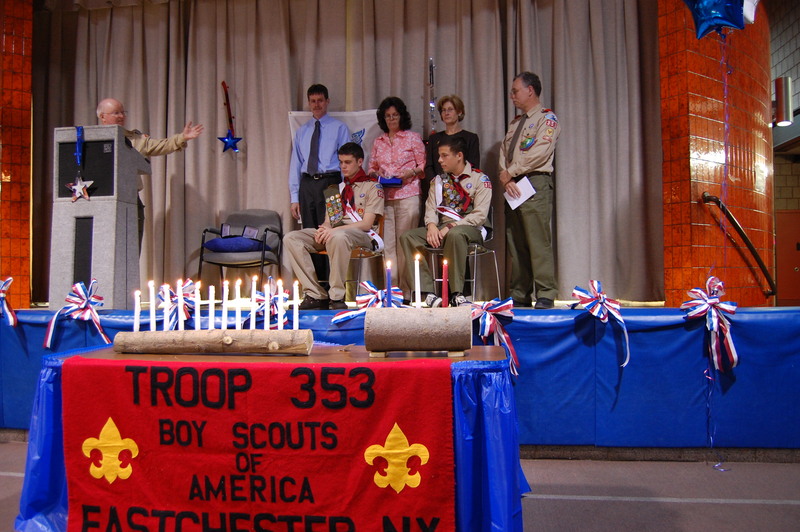 For a look at a very memorable night for Troop 353, check out these photos! Author scoutmasterPosted on November 11, 2008 February 24, 2009 Categories Activities, Advancement, Events, Merit Badges, Photos, Troop MeetingLeave a comment on Special Court of Honor Night! Eagle Scout Daniel A. inspires the boys in the troop to reach Eagle. According to statistical research provided by the BSA, fewer than 4% of all boys that enter Boy Scouts ever attain the coveted rank of Eagle Scout. 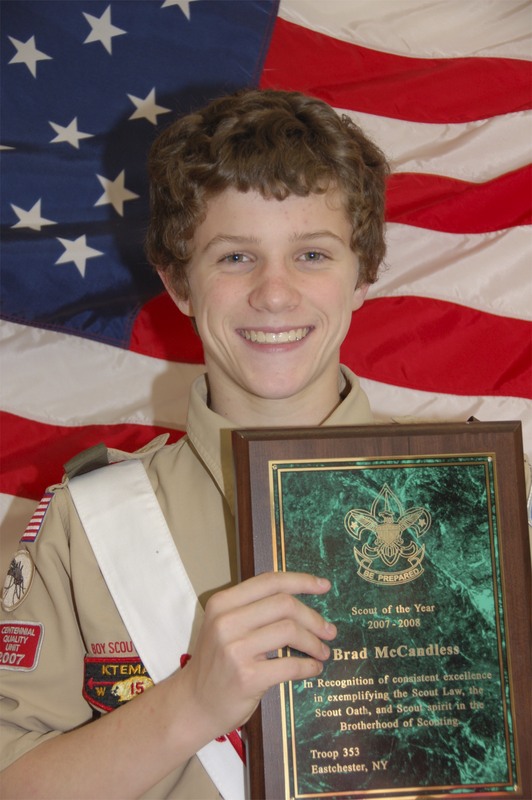 Troop 353 has been blessed with several Eagle Scouts over time, averaging about one a year. A considerable amount of Scouting literature has been devoted to the procedures for making Eagle Scout as well as how to customize an Eagle Court of Honor to fit the worthy Eagle candidate. Earlier this summer, troop 353 had the opportunity to celebrate the crowning achievement of Eagle Scout with one of our more proficient scouts and one that many adult Scouters knew all along would successful traverse the trail to Eagle Scout, Daniel A.
Dan’s achievements have been considerable both within Scouting and in his every day life. Dan is a member of the Order of the Arrow, attended Philmont, and during the past two years (a time of substantial growth and procedural changes for the troop) has been the SPL and a Troop Guide. In middle school, he was one of a few students chosen to attend a national youth leadership conference in Washington, DC. In high school, he was a member of the National Honor Society at Fordham Prep, a 12-season runner (and Captain) on the Cross-Country / Track & Field team, a Eucharist Minister, Deans’ Council and Campus Ministry Board member. For his school, he completed Service Projects in Appalachia and Ecuador. In addition, he is an usher at Immaculate Conception Church in Tuckahoe. Dan also assisted in coaching eight to ten-year-olds in baseball in Yonkers. 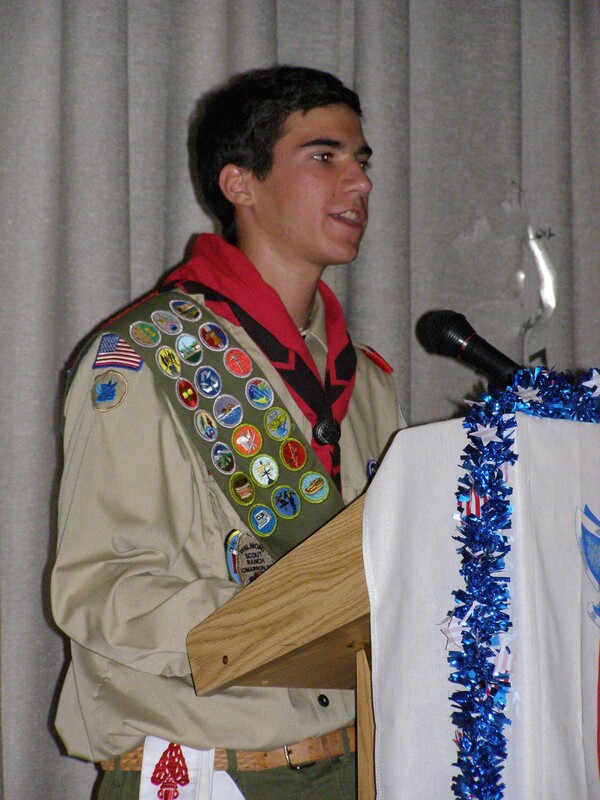 In sum, Dan has been a natural leader for some time and his abundant leadership qualities are considered to be the standard of excellence for Troop 353 youth leaders. He comes by this gift naturally, as both his father Dave and older brother Joe are also Eagle Scouts! Dan’s Eagle Court of Honor indeed reflected the core values that have become such an important and integral part of his life. Mr. Brian Carney, from the Campus Ministry at Fordham Prep, gave the opening Invocation. His brother Joe, gave the Eagle Charge for Dan to follow the rest of his life. Additional visiting dignitaries included the mayor of Tuckahoe and a representative from the Supervisor of Eastchester, Westchester County legislator and a representative from the American Red Cross in White Plains (where Dan completed his Eagle Leadership Project). As a testament to the respect Daniel commands, there were a record number of Eagle Scouts present as well as several of the troop’s former scoutmasters. Eagle Scouts hold a special place in our society–they are held to a higher standard by virtue of their own lofty accomplishments. And as Daniel will continue to discover, the coveted award of Eagle Scout will continually benefit him in life in ways that he could never imagine! Memorable photos from Dan’s Eagle Court of Honor. Details on Dan’s Eagle Leadership Project are described here. For example, one scenario outlined how a scout started running toward his tent from the campfire area, tripped on a rock, hit his head on another rock and endured a 2nd degree burn when his hand theoretically went into the fire. Yet another scenario highlighted a scout theoretically slipping on a rock in a nearly dried up creek bed while backpacking, twisting his ankle and cutting his hand on the fall. 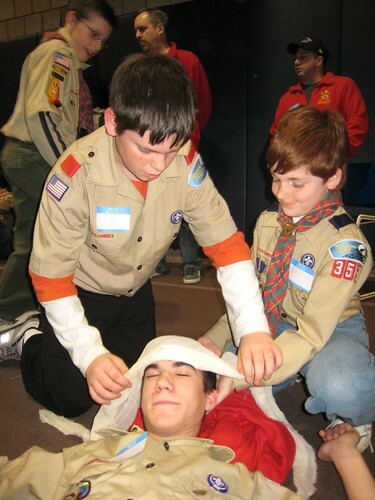 A combination of camping gear props, theatrical makeup and a very realistic scenario behind each “injured scout camper” created a lasting impression for the scouts that should reinforce the importance of administering first aid with a “cool head” for a variety of common injuries. Many more pictures from that troop meeting can be found here. On February 25th, Troop 353 enjoyed an evening of pure fun and enjoyment by reestablishing a former annual event dubbed the Olympiad Games! The evening’s festivities was also special in that several sr. Webelos from Pack 7 Tuckahoe and their parents were visiting. After a brief Patrol Meeting to inspect personal gear for the upcoming Ten Mile River campout, the Webelos were split up among the patrols & the scouts began their games! The scouts were challenged in basketball, foosball, table tennis and, a scout favorite, steal the bacon. After lots of grins, the Green Bar Patrol declared Kelsey W’s patrol of first year scouts the winner! Though each boy in that patrol received their award joyfully (nerf footballs) ALL boys basked in the warm glow of realization that Scouting really can be a lot of fun! For more fun photos, click here. Author scoutmasterPosted on March 7, 2007 March 7, 2007 Categories Activities, Events, Photos, Troop MeetingLeave a comment on Olympiad Games! Troop 353 was fortunate to have Westchester Putnam Council’s ace CPR instructor, John Clear, visit us recently for our annual CPR training. The instruction was highly effective, included hands-on skills building and written Red Cross exams. Mr. Clear enlightened the troop about recent changes to CPR standards, i.e., do not use more than 10 seconds to try and find a pulse during the early ABC stage–it wastes valuable time and most are unsuccessful at finding the pulse. Twenty individuals in Troop 353 are now Red Cross certfied to provide CPR. Of all the things a boy learns during his scouting experience, perhaps none is more important than CPR. For more photos, click here! On January 21st, Troop 353 welcomed senior Webelos from Pack 353. Though it was a very busy troop meeting, entailing final prep for the January 28th Klondike, gear check, etc., the visiting Webelos Nick & Joseph had no problem fitting right in to the flow of the evening! After some knot tying and lashing instruction, all of the boys engaged in a competitive inter-patrol event that entailed putting this instruction to the test, resulting in a very fun evening, capped off with refreshments afterwards. From all of your fellow scouts at Troop 353, Nick & Joseph thanks for visiting! You and your fathers are always welcomed and we hope to see you both join our troop in the near future! (For more great photos from that night, click here).